With more than 14 million consumers in the US now users of an Amazon Echo device, the conversation has once again shifted to music in the home, and whether Amazon will be able to make strides in the streaming market in 2017. Based on the 15th edition of MusicWatch’s Annual Music Survey we were able to estimate that more than 14 million US consumers reported using an Echo device, including Tap and Dot. That’s users, not necessarily buyers. Over the past few years the conversation around audio has been about mobility; connected cars, music on smartphones. With voice assisted devices, we’re back to talking about music in the home. Amazon reported that Jingle Bells was the holiday song that you most requested Alexa to play. The obvious question is whether 2017 will be the “Year of Amazon” when it comes to streaming, especially following the fall launch of Amazon Music Unlimited in the US. Perhaps that’s right, particularly as Prime membership and the Echo installed base continue to grow. 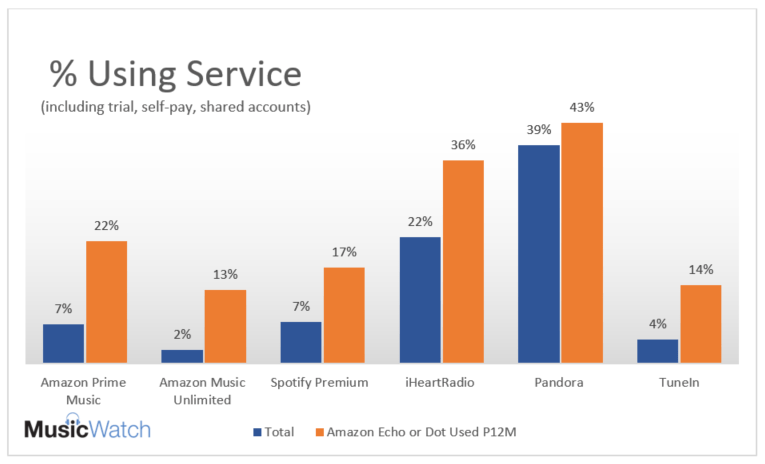 In the Annual Music Study, we observed that 13 percent of Echo users had listened to Amazon Music Unlimited, whether through a paid subscription, a trial or sharing an account. But we noticed something else that was interesting. There appears to be a halo effect on services that are on the Echo platform. As shown in the chart below, usage of iHeartRadio is 64 percent higher among Echo users compared to the total internet population. TuneIn has a nearly 4:1 lift in usage incidence among Echo users. Spotify has a more than 2:1 increase. To be fair, some of this difference is because Echo users are likely more tech savvy, early adopters who would be more likely to stream in the first place; and pay for the privilege. A decade ago Pandora appeared on the Apple app store, and went from near oblivion to the largest pure-play music streaming in the country. Will we see a similar effect thanks to Alexa? TuneIn’s brand awareness was a worst in class 18 percent in MusicWatch’s July Monitor study (among free services). Is Alexa the route to improve that? Will Spotify grow share of listening hours over Apple thanks to all those “Alexa, play Discovery Weekly” requests? How many more ads can iHeart sell now that we listen to KTU 103.5 in our cars, and our kitchens? My guess is yes to all the questions, but perhaps we should ask Alexa. *The MusicWatch Annual Music Study is based on 5200 respondents aged 13 and older, and projected to the US internet population. The study was fielded between December 17, 2016 and January 2, 2017. Respondents were asked past 12 month device usage.